An elegant WooCommerce theme with Amazon-like features and a dedicated focus on improving conversions. Let’s take a look at one of 2018’s newest & most exciting WooCommerce themes to hit the market, WoonderShop by ProteusThemes. (see: what is WooCommerce?) I’ll illustrate some of Woondershop’s best features and talk about some areas in which it could improve. Still shopping around? Check out our list of the top WooCommerce themes of the year. The WoonderShop theme can be used for just about any type of WooCommerce store, and works well with both physical & digital products. It’s elegant design will also display your blog posts in a responsive grid so you can show off your content marketing efforts. Free, 7-day, fully customizable demo with full admin rights. 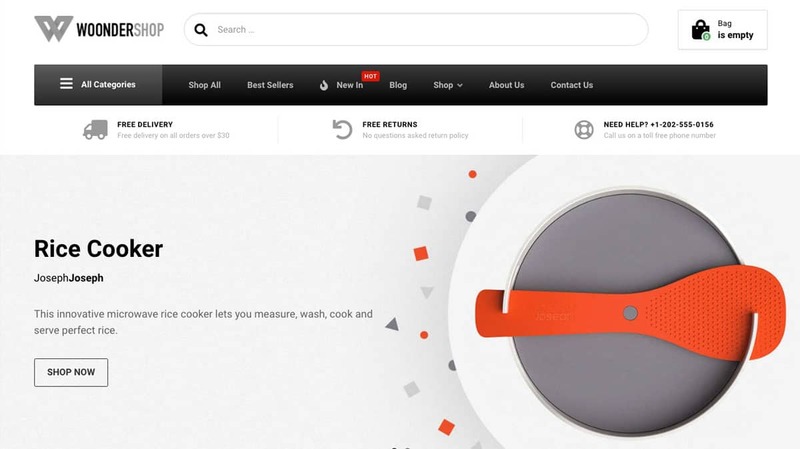 Let’s take a look at WoonderShop’s features that are specifically designed for ecommerce sites. Let your shoppers quickly find the products they’re looking for using WoonderShop’s AJAX search feature. Located in the header of all pages, just start typing and instantly see the results in a dropdown. Simple yet effective, WoonderShop provides a few of options for displaying your shop page. You can also customize the individual product pages. 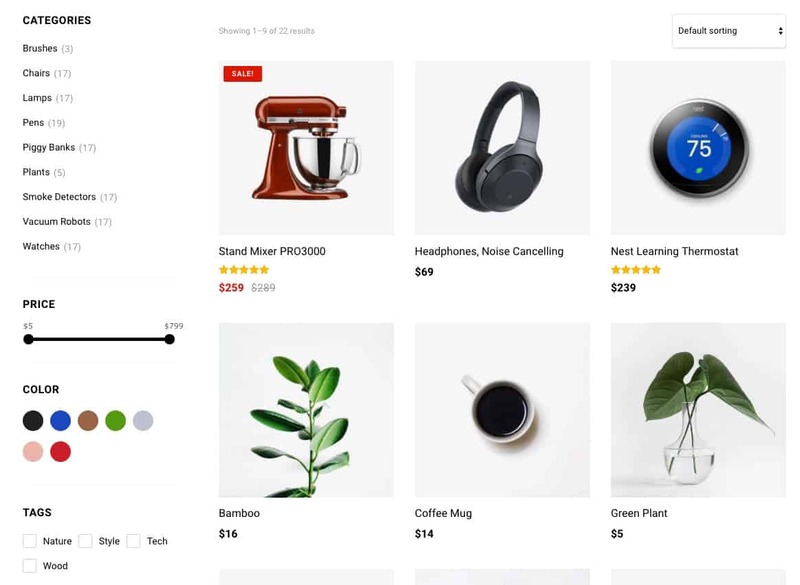 Here’s an animation of an individual product page being adding to the cart. There’s a nice hover-zoom on the product image, easy selection of a required color option, and a conversion-focused add-to-cart button. The WoonderShop theme comes pre-installed with some helpful widgets that can be added to several areas around your shop. WoonderShop Products: Display any number of WooCommerce products in customizable columns. Filter by category, best-selling, recently added, top-rated, on sale and more. 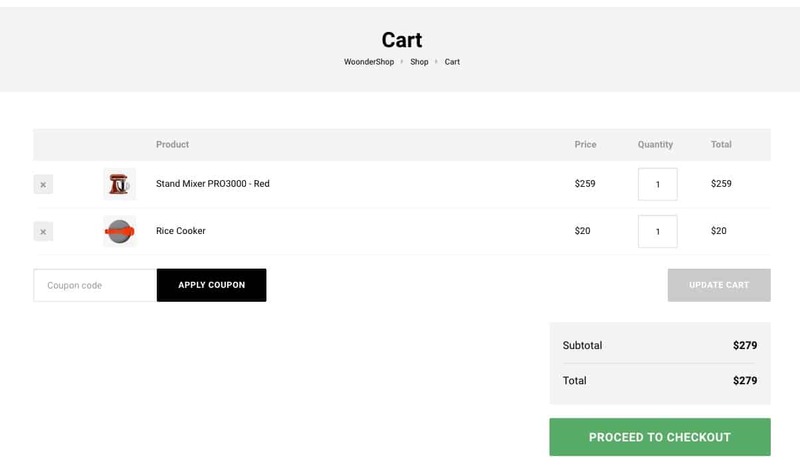 Because WoonderShop was designed for optimal conversions, they’ve removed anything that might be seen as distracting from the cart & checkout pages. If you’re already familiar with the SiteOrigin Page Builder, customizing WoonderShop will be a breeze. For new users, there will be a slight learning curve, but it provides a lot of flexibility for creating custom layouts. When installing WoonderShop, you can choose to import the demo content with one click. You can then learn from the demo layouts, and begin creating your own custom layouts. WoonderShop makes good use of the WordPress Customizer. You have access to change many elements of the theme by simply choosing custom colors, layouts, and other design elements. You can design the WoonderShop footer to include 1, 2, 3, 4, 5 or 6 columns, and add several widgets in each column. I don’t recommend you go overboard, but you have a good bit of flexibility. It’s quite clear that WoonderShop was specifically designed for mobile devices. The mobile design & layout are just as good, if not better, than it’s desktop appearance. Here’s a quick taste of how it looks on a mobile phone. Your users will have no trouble finding your products. The WoonderShop homepage highlights your best-selling items, or whichever products you want to promote. In addition to beautifully displaying your shop’s products, WoonderShop also makes your content stand out. Your blog posts are laid out in a responsive grid, showcasing the featured image for each post. One of the things I value most about ProteusThemes is their dedication to high standards. 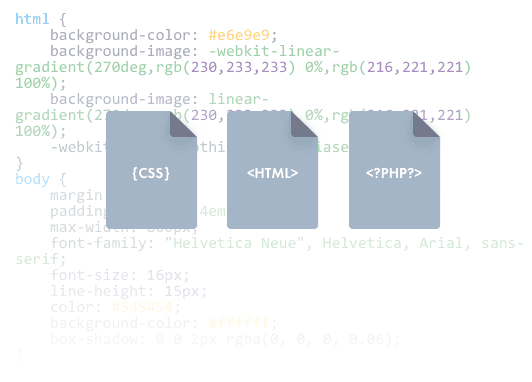 Every piece of code that goes into all of their themes is optimized for speed & security. They even go so far as to have their themes reviewed by two of the best WordPress theme review services out there. I’m really excited about the future of WoonderShop. The guys are ProteusThemes have fully dedicated themselves to this theme and made it their top priority for the next few years. You’ll definitely see lots of improvements to an already excellent WooCommerce theme. For those looking to fully customize every aspect of WoonderShop, be prepared for a learning curve to master the SiteOrigin Page Builder. But as ProteusThemes continues improving WoonderShop, I expect to see a lot more options aimed at getting customers to buy your stuff 🤑. Hi! I like the layout of wondershop. Does it support WooCommerce plug-ins, and can the headers and other info on the pages be translated to Finnish? 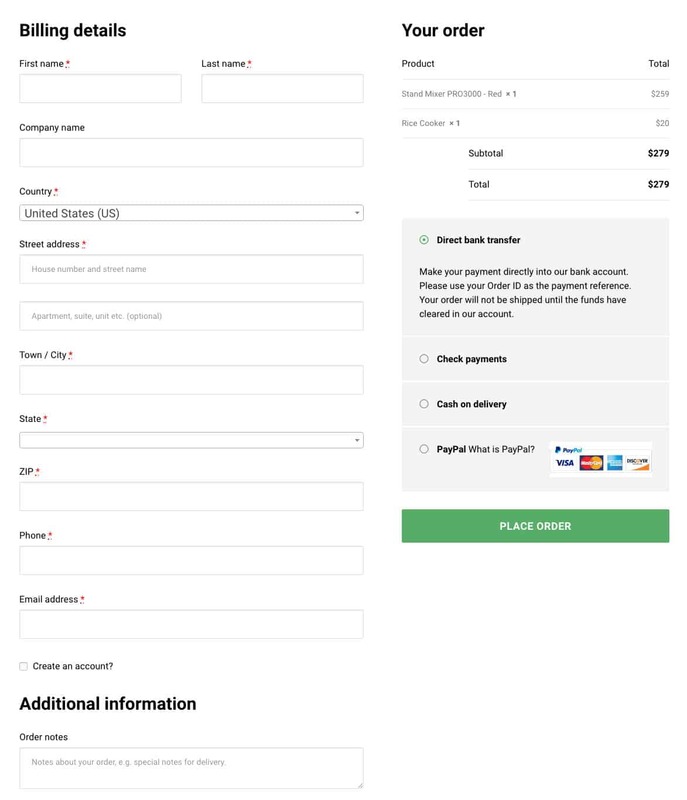 Finally, can I add more payment options to the check- out page? 1. Support WooCommerce plugins… YES. 2. Translated to Finnish… YES, but it might require an additional plugin. This article has more. 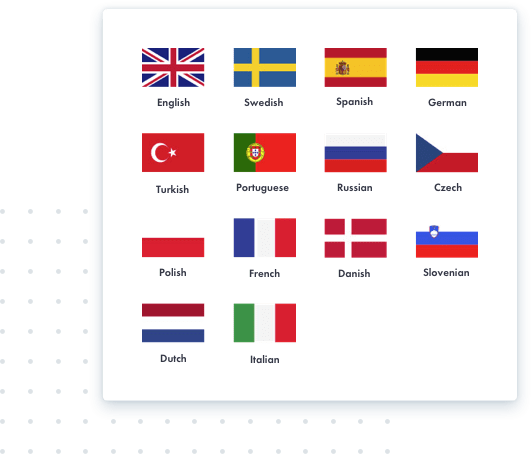 Here are the 14 languages that it will work with out of the box (no plugin required). 3. Payment options… YES. The WoonderShop Theme works with all WooCommerce payment options listed here. 1. I want to use Tychesoftwares Order Delivery Pro plugin because it has delivery slots and you can limit the number of deliveries per slot. It is 100% WooCommerce compatible, so can I assume that it works with WoonderShop? 2. I need an INTRO page, where it displays a photograph and has some text, such as “Welcome to XYZ Store” and then has a button which can be routed to a page, such as HOME or SHOP. Do you have an INTRO page or can I just make my HOME page look like an INTRO page and the button routes to the SHOP page? My shop page will function as a home page anyways because my customers just want to choose their products, place their order, and go. I’m not selling fashion products, where people want to take their time and browse. 3. Using the demo, I can’t find a way to change the cart icon from a bag to a cart. My customers won’t understand that the bag is the cart. Is there an easy way to replace the bag icon with the cart icon? I’ve spent some time walking through the demo and it’s quite nice. The main reason I’m looking at WoonderShop is because you have a nice shop theme and it will automatically resize to fit tablets and other mobile devices. I started out with StoreFront, but there are some pages which don’t resize very nicely and I think many of customers will want to place their orders using smart phones or tablets. So, thanks for answering my questions. Once I get the answers, then I will be in a position to decide whether to purchase WoonderShop. Of all the themes I’ve considered so far, it seems to be the best. 1. Yes, the Tychesoftwares Order Delivery Pro plugin will also work with WoonderShop. However, you might need to add some additional CSS to style the plugin to fit in with the styles of WoonderShop. But the plugin itself should come with basic styles that look decent. — You can reach out to ProteusThemes directly to confirm this. If you’re already on one of their free demos, just use the live chat feature. 2. I would just use your HOME page as the intro page, and then link to your SHOP page from there. In the demo, you’ll notice these are two separate pages. Open up the Home page, and you can either customize the slider to include just one slide that links to your /shop/ page, or you can use the page builder below the slider. Maybe try an Image Banner widget that links to /shop/. 3. There is no super-simple setting for this, but it’s definitely possible. I changed one tiny piece of code in the header and made it work. WoonderShop uses Font Awesome, which supports A TON of icons. So with a tiny bit of customization, you can use many different icons throughout the theme. Their support team would probably be nice enough to help you make these small changes. Thanks! You really went beyond the call of duty in answering all my questions. 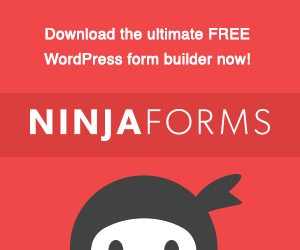 When I purchase a theme (very soon), I will definitely use your link. Really looked forward to using this theme. Unfortunately the payment system was buggy. Hi Cathy — Sorry you had a bad experience. Can you provide a little more detail as to what the issue was? Payment systems are usually handled via WooCommerce itself, not the theme. I’m curious as to your issues because I want to make sure I can communicate to my readers if there are indeed problems with the Woondershop theme.